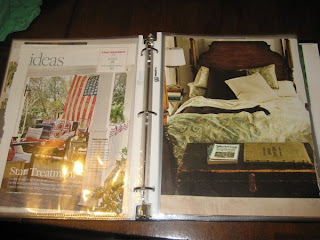 I am always tearing pictures and ideas that I like out of magazines and catalogs. I used to just keep them in a big pile in the office but I am trying to be more organized lately so I got an empty binder and some page protectors and went to work on my inspiration binder! 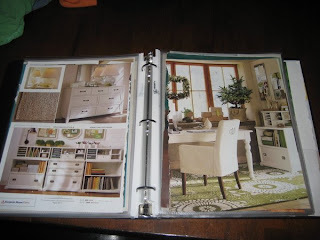 In it I have pictures of rooms and decor that I like, craft ideas, and recipe ideas that I want to try! Here are some pictures of my binder! I love it! 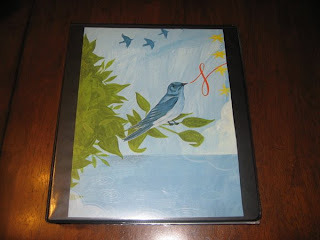 Speaking of inspiration I came across this idea the other day and I love it! 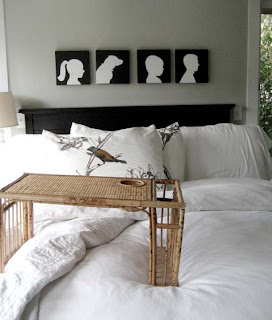 When our little one comes I would love to make this project to go above our bed! that's so fun!! i need to put all mine together like that too! What a really neat idea! I think I might try this, too. Wedding stuff is piling up EVERYWHERE, even though I have a wedding planner thing, lol.